The month is winding to a close and I don’t like for an entire month to transpire without making sure I play at least one strange new (old) game. So I picked one that I have had my eye on for quite some time due to its natural mysteriousness: Sky Island Mysteries. See? “Mystery” is right there in the title. Combined with sparse cover art and no manual, it sounds intriguing. As usual, my interest was quickly dashed when I dove into the actual content. It’s another Macromedia Director-driven educational kids game. One thing I’ve finally started to notice about these games is that I’m pretty sure I’m hearing a lot of the same sound effects among various Director-derived games. I’m beginning to suspect that Director comes with a library of royalty-free sound effects that authors are allowed to distribute in their games. So here I am, enlisted as a special assistant to one detective Joe Clue-steau. At Clue Central, he describes an outbreak of criminal activity and how I can help gather clues. (Brief aside: I wonder if I’m the only one who has been trained to cringe at the word “clue”? In the last decade, the word has so often been used in the context of an epithet.) 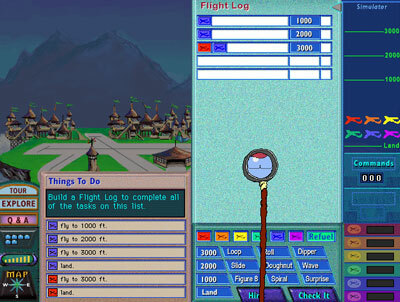 The method for gathering clues is to solve puzzles unique to each of 3 sky islands. This doesn’t actually have anything to do with sleuthing, from what I could discern. After solving enough puzzles, some snake creature goes and retrieves a clue for us. One type of puzzle — seen above — is the rebus found on, well, Rebus Isle. I had never heard of this before but it was certainly interesting. Based on the pictorial and animated clues, add or subtract sounds to develop words that answer the joke riddles. The one above was the most complicated that I encountered. It seems that rebus puzzles require a decent command of English phonetics. Then there was Airshow Isle as shown above. To be honest, I was completely baffled by this one– something about organizing the logistics and flight plans of an entire airshow. Aren’t we supposed to be catching criminals, darn it? I just took a screenshot and moved on to Stadium Isle, home of — you guessed it — the stadium. The puzzle involves something called “Fripple”. The game doesn’t make it entirely clear what a Fripple is. Depending on the context I heard the word used, it could either be the sporting event being played in the stadium, or the race of misshapen creatures gathered for the event. 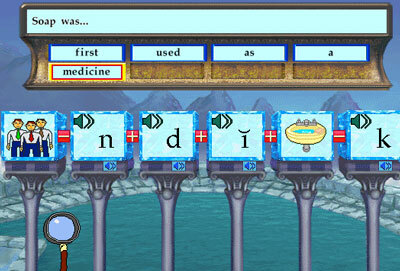 The player’s job during these puzzles is to place different creatures in seats depending on certain ad-hoc rules for those creatures. E.g., the cheerleaders only feel secure cheering when their sitting near other cheerleaders. I assure you that, despite your overactive imagination and cynical worldview, the Fripples do something quite innocuous. Somewhere along the line, these inane puzzles were supposed to net me enough clue currency to whittle down the list of suspects and solve various mysteries. No one has ever accused me of being very civic-minded and I didn’t care that much about taking a bite out of crime. I guess that makes me part of the problem rather than the solution.